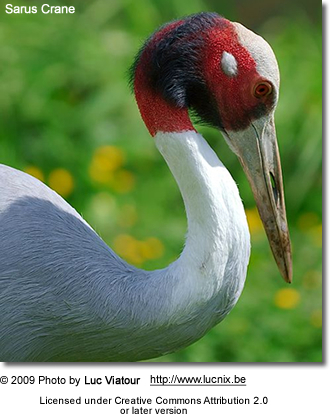 The Sarus Crane (Grus antigone) is a resident breeding bird in northern India, Nepal, Southeast Asia and Queensland, Australia. It used to be found on occasion in Pakistan, but has not been found since the late 1980s. These birds are usually seen in small groups of 2-5 and they forage while walking in shallow water or in fields, sometimes probing with their long bills. It is the world's tallest flying bird. 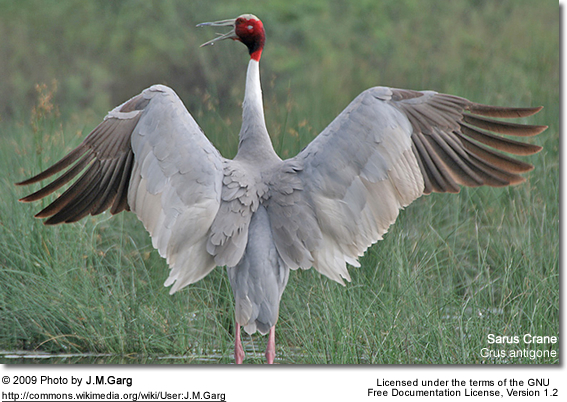 This is a very large crane, averaging 156 cm in length, which is found in freshwater marshes and plains. Adults are grey with a bare red head and white crown and a long dark pointed bill. 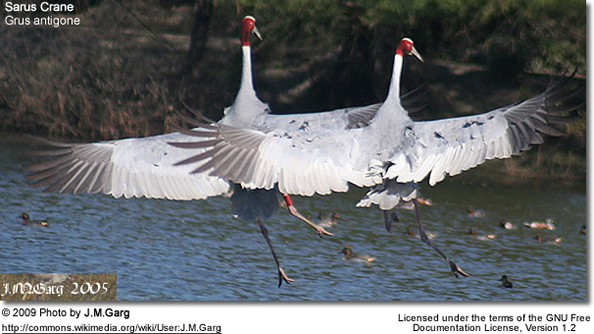 In flight, the long neck is kept straight, unlike herons, and the black wing tips can be seen; their long red or pink legs trail behind them. Males and females look alike, but young birds are duller and browner. The Indian, Southeast Asian and Australian subspecies differ mainly in plumage shade. there are some slight size differences, but on average the male is larger than the female. These males can exceed six feet in height and have an eight+ foot wingspan, making them the tallest living flying bird. It nests on the ground, laying two to three eggs in a bulky nest. 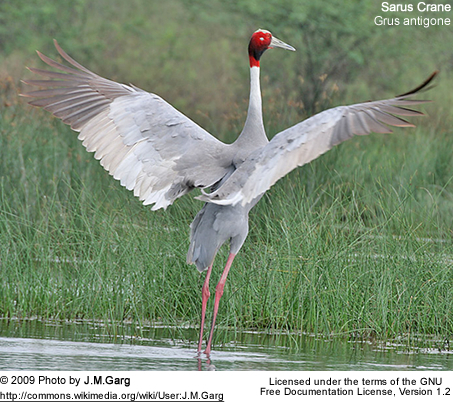 Unlike many cranes which make long migrations, the Sarus Crane does not. Both the male and female take turns sitting on the nest, and the male is the main protector. The Indian population is about 10,000 birds, and the Australian population of 5,000 birds may be increasing, but the southeast Asian subspecies has been decimated by war and habitat modification and destruction (such as intensive agriculture and draining of wetlands). 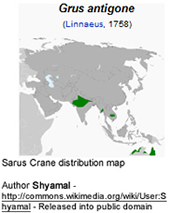 The species is venerated in India and legend has it that Valmiki cursed a hunter for killing a Sarus and was then inspired to write the epic Ramayana. 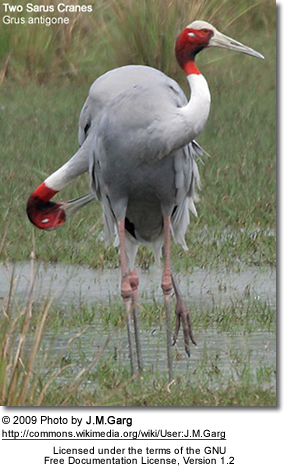 In Australia, the Sarus can easily be mistaken for the Brolga. 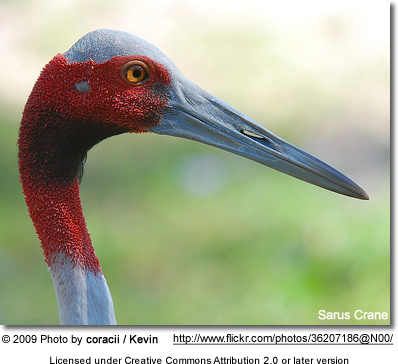 The Brolga has a more widespread distribution across Australia, and its red colouring is confined to the head. 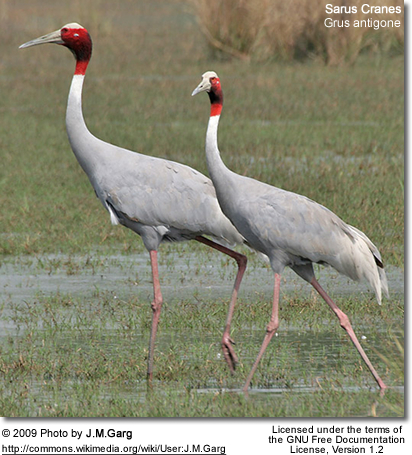 The Brolga and Sarus are genetically quite distinct.